Five hackers—an Anonymous-style rabble-rouser, an Arab Spring hacktivist, a black-hat hacker, an old-school cipherpunk, and an online troll—are detained by the U.S. government, forced to work as white-hat hackers for Uncle Sam in order to avoid federal prison. 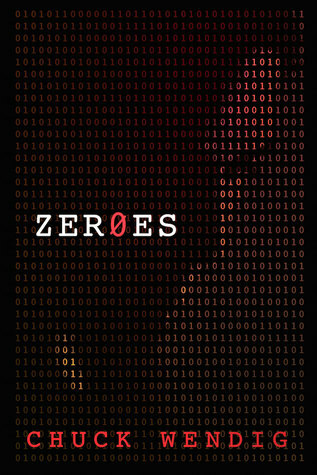 At a secret complex known only as "the Lodge," where they will spend the next year working as an elite cyber-espionage team, these misfits dub themselves "the Zeroes." But once the Zeroes begin to work, they uncover secrets that would make even the most dedicated conspiracy theorist's head spin. And soon they're not just trying to serve their time, they're also trying to perform the ultimate hack: burrowing deep into the U.S. government from the inside, and hoping they'll get out alive. 5 hackers are made to work for the government. They are sent to a secret location without any contact to the outside world and without knowing what they work on. As the hackers that they are, they try to find out what is going on and learn about Typhon, an artificial intelligence. When everyone at the base is killed the Zer0es flee and get to a secret location, to one of Wade’s old friends, always being followed by the Compiler, a guy connected to Typhon. After having a break for a few months, they are found again and decide to go against Typhon. They find out about Typhon’s location and go after it. They are able to shut it down and keep it on their own HD. The five are drugged and brought to “The Hunter Lodge” another secret location. They meet each other for the first time and get along splendidly, not. Graves wants Raegon to set Chance up by putting a USB stick into his pocket that contains data for which he will get in trouble but Reagon sets Graves up instead. When the doors open for them again, the Zer0es get a car and flee. The are followed by the Compiler, who is connected to and controlled by Typhon. Wade is able to shoot him but Typhon takes over their car and they crash but are able to flee. Months later, Typhon causes a plane to crash and the Zer0es are made responsible. Their pictures show up on TV and not only the Compiler but also Hollis is able to find them again. Just when Hollis arrives at their place, the Compiler attacks. Chance, Aleena and Wade go to Manhattan where they suspect Typhon’s main system while DeAndre, Reagon and Hollis go to West Virginia to a farmhouse where another system connected to Typhon is. Aleena gets the Widow to help them. The Widow causes a power outage so that they get into the city unnoticed. With the help of DeAndre they get into the building where Typhon is. Typhon has their relatives and Wade is ready to give up for his daughter. Aleena is plugged in too by Shane who Chance then tries to kill. Only by turning up the heat in the building are they able to get Typhon to back up. Typhon starts to flee to a backup location but DeAndre catches her on his own hard-drive. 6 months later, the now unplugged people are still not okay and in a dream-like state. Leslie is brain dead.The Zer0es are cleared of all their wrong doings and their lives turn back to normal. Chance is caught and held by 3 Chinese men, a possible set up by the Widow. They question him about Typhon and how they stopped it. With the help of the Widow he is able to flee though and he gets picked up by his crew in a helicopter. He leaves the Widow their phones as payment for her help. why does the widow want the phones?